I finished a pair of socks on Monday. My first thought was – great! – I can take pictures and get a blog post ready in time for Wednesday. It’s good to actually talk about knitting now and again on a blog with the word “knits” in the title, I think. And then my second thought was – boring! – another pair of picot edge stockinette socks. Like you all haven’t seen that a gazillion times right here. 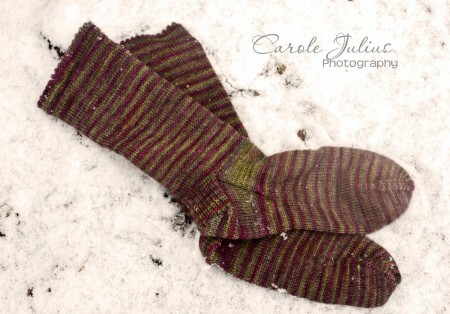 Nevertheless, I pulled out the camera yesterday and I staged them in the freshly fallen snow, trying to get some photos that didn’t look like every-other-photo of a finished pair of socks. I basically failed at getting anything unique. This here’s the “whole sock” photo. And then there’s the “toe” photo. And, finally, the “artistic” one. Nothing new at all. As I was processing the photos, adjusting the contrast and adding a warming filter and all that jazz, I was struck by all of those tiny stitches. They line up perfectly and there are just so many of them and even after all this time I sort of can’t believe that I can take sticks and string and make something so pretty. I guess a finished pair of socks isn’t boring after all. Those socks are lovely! Color of this pair speaks November, and picot edge lifts them to the extraordinary category. 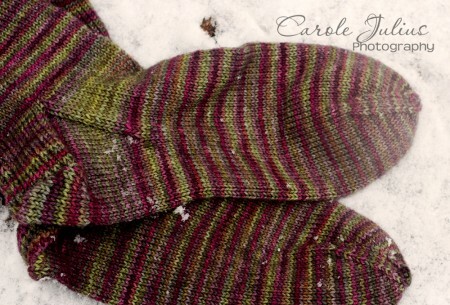 We sock knitters never tire of seeing hand knit socks! Keep posting them, please! I never tire of your FOs. I don’t think I am easily amused either. Colors are always different. Nope. Not by a long shot is that boring. Lovely plain vanillas!!! Socks are never boring. I too love all of those lined up stitches and how the colors play out. What’s the yarn and colorway? Looks like Judy’s sock yarn in Kale? I think I may have a skein in my stash somewhere. Beautiful colors! Your socks are a work of art. 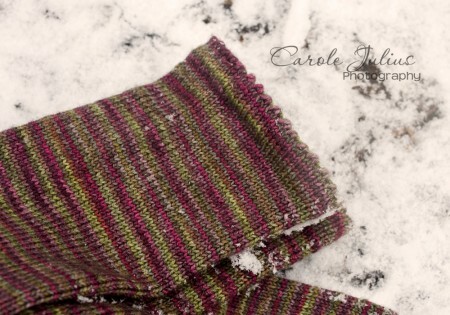 Each pair with its perfectly formed tiny stitches and the fun and amusing blend of colors is a joy to see. Thank you for doing so!! Since I’ve got a pair of handspun handknit socks in progress in my lap right now, I can attest to the never-ending enjoyment of sock knitting. Lovely socks, and I’m envying you the snow. Posting pictures of your hand knit socks is never boring!!! Just lovely and never boring. And as you’ve said – really pretty amazing! Maybe I’ll finish my 1-3/4 done pair over the holidaze! I think lots of people think that if you can knit a pair of socks, you can do anything. 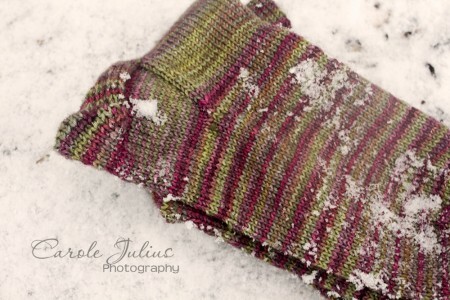 In one of her books, Stephanie Pearl-McPhee estimated that the average sock contains about 17,000 stitches. Multiply by two and you’ve knit 34,000 stitches! That’s not boring; that’s nothing short of amazing and your lovely photos prove it! Not boring at all. And yours is my favorite sock pattern. Just think – all around the universe, people have socks on their feet and ankles with that picot edge, thanks to your posts. That’s really something! They are a work of art, as is everything you knit. And for the record – socks can NEVER get boring! You are so right and the socks are lovely. You should take some kind of informal poll asking how many people are knitting similar socks while they read your blog. (I’m on a hat and mitten jag right now.) And your latest pair is lovely—please give us details on the yarn. I really, really love the colors in these! What yarn did you use? Not boring at all! Those socks are not boring at all. And all of the pics are artistic. I’ll show you mine someday (minus the tops, toes and heads). You didn’t mention the yarn though, it’s really pretty and available?? Nope. Not boring. I love them.